California State Parks and the San Mateo County Resource Conservation District (SMCRCD) issued a press release on August 15, 2018 to announce the start of the Butano Creek Channel Reconnection and Resiliency Project on September 6, 2018 with an anticipated completion date of October 2019. 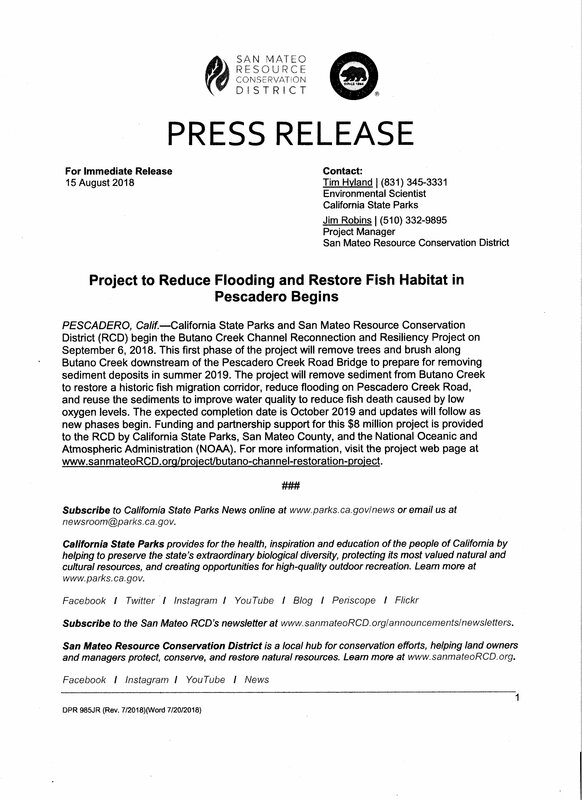 This project is part of a multi-phase plan to reduce flooding in the community of Pescadero, and to provide better fish passageways and improve water quality in and through the Marsh. While Coastside State Parks Association is not participating in this particular project, we fully support the improvement of the Marsh and the protection for endangered species. We will continue to report back to you, our readers and supporters, as progress is made. Coastside State Parks Association supports 15 State parks and beaches along the San Mateo County coast including Pescadero Marsh.